A Lot of people don’t realise you can actually complete a divorce online, the UK’s original divorce service is DivorceOnline.co.uk. They offer quick 24 hour turnaround times from as little as £59. They make it quick, easy and painfree as possible, saving on time and costs. There of course different levels of complexities and this where Divorce Online offer different levels depending on your situation. 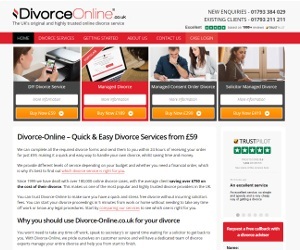 Divorce Online started in 1999 and have now dealt with over 180,000 online divorce cases, showing the popularity of the service. Being online also means the process will feel more seamless. They state you can start your divorce proceedings in as little as 5 minutes.